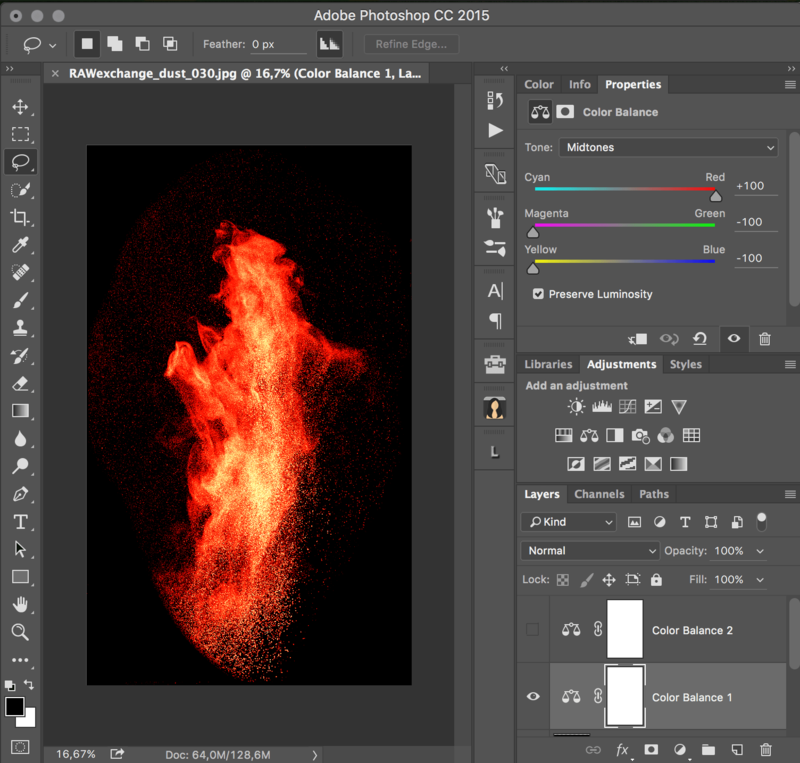 Time to dust up on your Color Balance Adjustment Layer. Here’s a quick Photoshop trick that will add some more magic (or magical fire and ice) to your composites. This technique works wonders using dust particles shot against a back background. You can shoot this yourself or use a pre-made dust resource if you don’t have the energies to vacuum all the mess such a shoot creates. 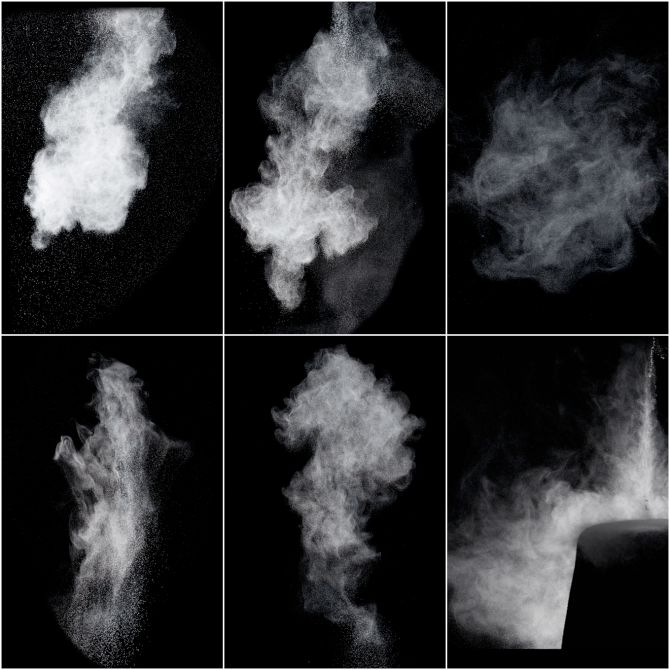 The Dust Pack photos has a unique quality that it looks like smoke, but also like particles, which makes it ideal to use as either one, or as a magical combination. There are some amazing formations in that package so have a look. Now these Dust images are all shades of white, where more particles converge more white can be seen, where there’s less, there’s variations of grey. You could state that the dust particle formations consist of highlights (lots of particles), Midtones (less particles) and shadows (none to no particles). And there is this one adjustment layer that handles with highlights, Midtones and shadows. And that is the Color Balance Adjustment Layer. The Color Balance Adjustment Layer has a tone effector (Midtones, Highlights, Shadows) three coloured sliders (Cyan to Red, Magenta Green, Yellow to Blue), and a “preserve luminosity” checkbox. make sure you keep the “preserve luminosity” checkbox checked. Lets start with the Midtones. All sliders are set in neutral (0) and by pulling on the sliders you can change the colours of the image. You’ll see the image turn from simple white to a red dust cloud. this should add a yellow look to your highlights. 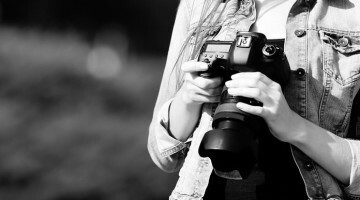 If it doesn’t look to your liking adjust the sliders where necessary. You can adjust sliders in in the Shadows section, but be carefull. If the background isn’t fully black it might get a colorcast and we don’t want that. So there you have it, a simple effect with awesome output. Try and make some magicall blues, or greens, or whatever color you’d like. This technique should work fine on other texture packs as well, like smoke, lightbeams etc. below is a quick video where I add this technique to a prepared image. Enjoy. Use The Power Of Look Up Tables To Tone, Grade and Color Correct Your Photos How To Throw Flour At A Model While Keeping the Studio Clean (Hint, by Cheating) How To Create Three Dimensional Space In Your Composites Aerial Perspective – The depth your images have been consciously missing. Roderique "Dracorubio" Arisiaman is a professional photographer, photoshop wizard, and artist, using photography as his canvas to create beyond reality imagery and stories. you can follow Dracorubio on his site, facebook and G+ account. This is awesome! I didn’t know how to color anything like that! I got some ‘Powder’ images in a bundle I purchased. They were pre-colored, but, I could never get the coloring right if I wanted to make it my own color.